Background: One of the common types of oro-dental morphopathologic relationship is the Class II Division 1 malocclusion. Therefore, the study of tongue position in Class II Division 1 may reveal a role of the tongue in the etiology or diagnosis of malocclusion. Aims: Present study was done with the aim to evaluate the tongue position radiographically in centric occlusion and rest position in the subjects with Angle's Class 1 normal occlusion and subjects with Angle's Class II Division 1 malocclusion and to find out any differences in tongue position between Angle's Class 1 normal occlusion and Angle's Class II Division 1 malocclusion group. Materials and Methods: The present study was conducted on lateral cephalogram of 40 subjects between the age ranges of 16 to 22 years. The samples were divided into the Angle's Class 1 normal occlusion group (Group I) and the Angle's Class II Division 1 malocclusion group (Group II) with the 20 in each groups. The study involved the evaluation of tongue position at rest position and centric occlusion on the lateral head cephalogram. Results: This study for the evaluation of the tongue position from the rest position to the centric occlusion showed no statistically significant changes in both groups. However, there were greater changes in various parameters (From the rest position to the centric occlusion) in the subjects with Angle's Class II Division 1 malocclusion as compared to the subjects with the Angle's Class I normal occlusion group. Conclusion: From the present study following conclusion can be drawn: with the closure of mandible from the rest position to centric occlusion the tongue moved antero-superiorly in the tip region, superiorly in the dorsum region, and antero-superiorly in the posterior region in normal occlusion and postero-superiorly in Class II Division 1 malocclusion. Tongue is the most agile, versatile appendage in the body. It is the largest organ of the oral cavity and has no skeletal bony base. Peat  emphasized the role of tongue in positioning the dentoalveolar structures. Not only the function, but also the posture, size, and shape of the tongue are of significance. Rakosi  proposed that the growth, posture, and function of tongue are important. Abnormalities of either posture or function could possibly contribute to development of malocclusion and speech defects. , It is also possible that malocclusion could be the cause of abnormal posture of tongue. Fishman  also demonstrated that form and function have some direct relationship to abnormal tongue posture and movement. These findings suggest that position of tongue is related to the dentoalveolar morphology. For this, the position of tongue should be evaluated in both centric occlusion and rest position because most of the time tongue remains in the rest position. One of the common types of oro-dental morphopathologic relationship is the Angle's Class II Division 1 malocclusion. In this dento-skeletal relationship, many compensatory alteration of functions are observed. Moreover, the tongue is probably the most active functional part of the oropharyngeal system and it is directly influenced by modifications in oro-dental environment, especially of the mandible. Therefore, the study of tongue position in the Angle's Class II Division 1 may reveal a role of the tongue in the etiology or diagnosis of malocclusion. It is very important to examine the tongue while making diagnosis and treatment planning. The differential diagnosis of abnormal tongue posture should be made before prescribing any therapy. The present study was done with the aim to evaluate the tongue position radiographically in centric occlusion and the rest position in the subjects with Angle's Class I normal occlusion and Angle's Class II Division 1 malocclusion and to find out any differences in tongue position between both groups. The present study was conducted on lateral cephalogram of 40 subjects between the age ranges of 16 to 22 years. The subjects were divided into two groups with the 20 subjects in each group. Group I included the subjects with Angle's Class I normal occlusion with proper alignment, normal overjet, normal overbite, and with no obvious detrimental habits, while group II consist of subjects with full cusp Angle's Class II Division 1 malocclusion with the overjet more than 5 mm. Subjects who had full set of teeth except the third molar, no history of facial and dental asymmetry, no parafunctional habit, and no history of orthodontic treatment were selected. The study was approved by board of research studies of our university and a written informed consent was obtained from each participant or their parents before inclusion in this study. The study involved the evaluation of tongue position at rest and occlusion on the lateral head cephalogram. 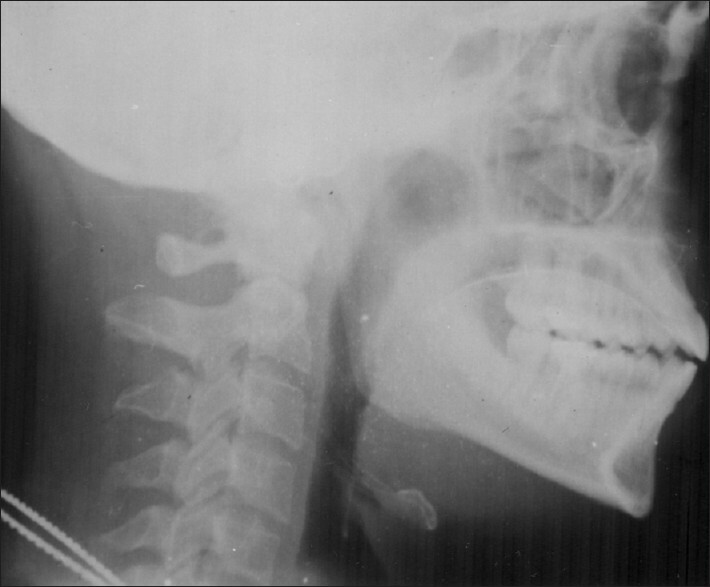 Standardized lateral head cephalometric radiograph of the individuals were taken with a universal cephalometer counter balancing type (Rotograph Plus, Villa system medical, Italy) at the rest position and in centric occlusion, in such a way that the Frankfort horizontal plane of individual was parallel to the floor, lips were in relaxed position and teeth in centric occlusion or in the rest position. The films were exposed in 30 mA, 70 KV power for 2.0 s at object to the film distance of 5 feet for each patient. For taking the radiograph in the rest position, subject was asked to relax and was asked to pronounce "Ram or Mississippi " and stop after pronouncing. To make the soft tissue out line of tongue more clearly in radiographs, a radio-opaque material barium sulfate  solution was coated on the dorsum of tongue from tip up to the most distal point. For coating the tongue, subjects were asked to protrude the tongue, then tongue was coated in midline with the help of a plastic brush. After taking the cephalogram in the rest position [Figure 1], another cephalogram was taken in centric occlusion [Figure 2]. Following 11 landmarks [Figure 3] were selected and marked on lateral head cephalogram tracing. To evaluate the tongue position following 10 parameters [Figure 4] were measured on the lateral head cephalogram both cephalogram taken in the rest position and centric occlusion by two examiners for all subjects. Inter-examiner reliability of the reproducibility of the measurements was assessed during the study in seven subjects and the "k" score for all measurements was never lower than 0.82.
tg1: Partial length of tongue (Rakosi, 1982): Line through the O and ii. tgl measures the length of the tongue in the posterior portion (root) of the tongue. tg2: Partial length of tongue (Rakosi, 1982): Line constructed on O at 30° Mc-ii line. tg2 indicates the partial length of the tongue in the posterior region of the dorsum. tg3: Partial length of tongue (Rakosi, 1982): Line constructed on O at 60° Mc-ii line. tg3 indicates the partial length of the middle part of the dorsum of the tongue. tg4: Partial length of tongue (Rakosi, 1982): Line constructed on O at 90° Mc-ii line. tg4 indicates the partial length of the tongue in the middle of the dorsum of tongue. tg5: Partial length of tongue (Rakosi, 1982): Line constructed on O at 120° Mc-ii line. tg6: Partial length of tongue (Rakosi, 1982): Line constructed on O at 150° Mc-ii line. tg6 indicates the partial length of the tongue in the anterior region of the tongue. tg7: Partial length of tongue (Rakosi, 1982): Line constructed on O at 180° Mc-ii line. tg7 indicates the partial length of the tongue in the tip region. 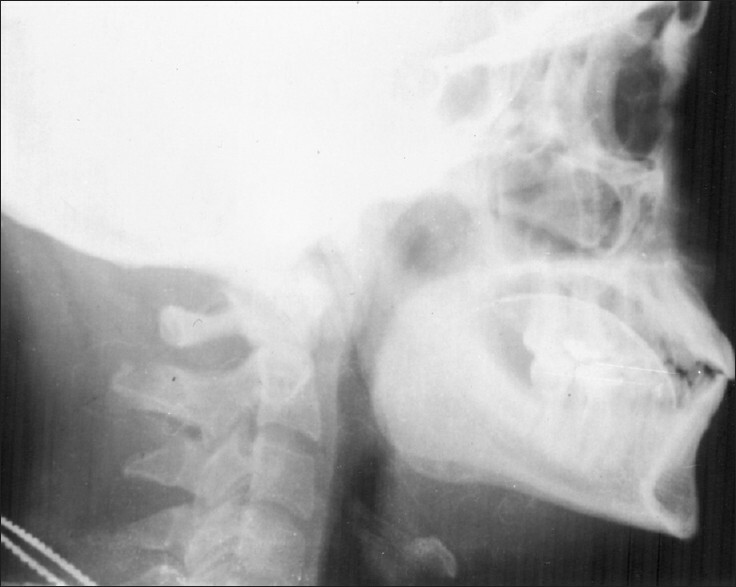 TGH: Tongue height (Lowe et al., 1986): This is perpendicular to the mid of E-TT line (line between the most antero-inferior point of epiglottis and tongue tip). It measures the height of the tongue during the rest and centric occlusion. 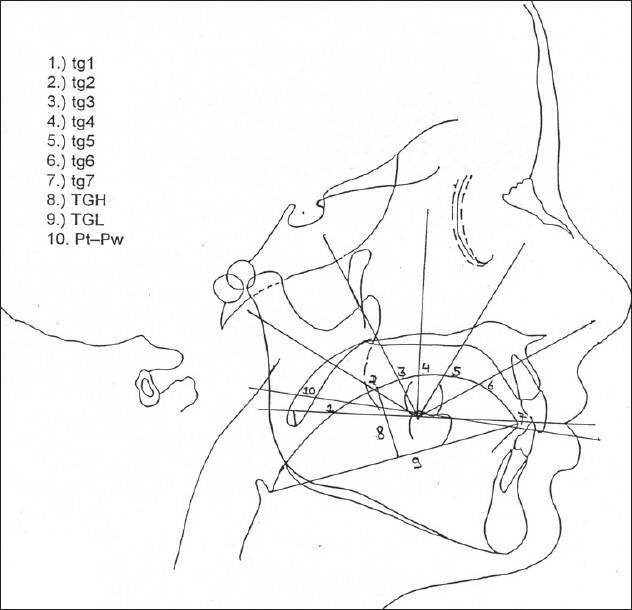 TGL: Tongue length (Lowe et al., 1986).This is measured by distance between tongue tip (TT) and epiglottis (E) point. 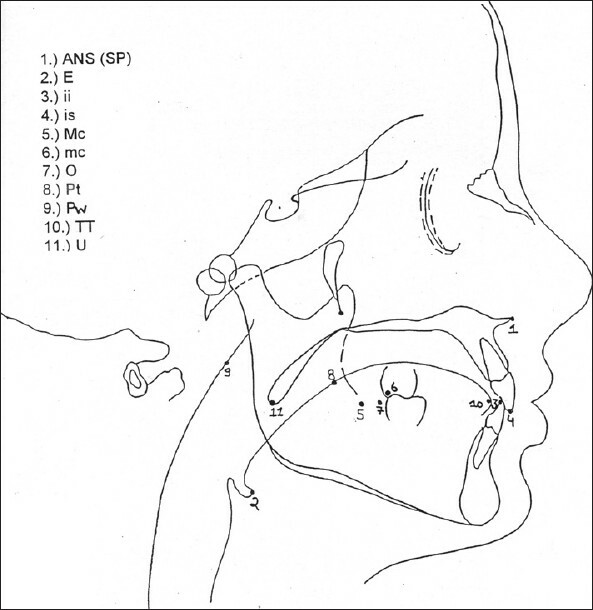 Pt- Pw: Distance of tongue from pharyngeal wall (Iogervall and Schomaker, 1990). This measures the distance of root part and posterior part of dorsum of tongue from the pharyngeal wall. Ten variables were measured and data obtained was analyzed by paired "t0" test and Student "t" test for obtaining mean, standard deviation Comparison of each group in the rest position and centric occlusion were made and comparisons were also made between the groups. A probability (P) less than 0.05 (P<0.05) was considered statistically significant. [Table 1] shows the mean values and standard deviation for various parameters in centric occlusion and in the rest position for group I. [Table 1] depicts that out of various parameters for partial tongue length the maximum value was shown by tg7 (32.22±0.59) and the minimum value is shown by tg4 (14.17±0.41) in centric occlusion while in the rest position it was maximum for tg 1 (32.88±0.33) and minimum for tg 4 (10.73±6.37). [Table 2] shows the mean values and standard deviation for various parameters in centric occlusion and in the rest position for group II. [Table 2] depicts that out of various parameters for partial tongue length, the maximum value was shown by tg7 (33.55±0.26) and the minimum value is shown by tg4 (l6.00±0.38) in centric occlusion, while in the rest position it was maximum for tg 1 (31.02±0.48) and minimum for tg 5 (12.27±0.35). 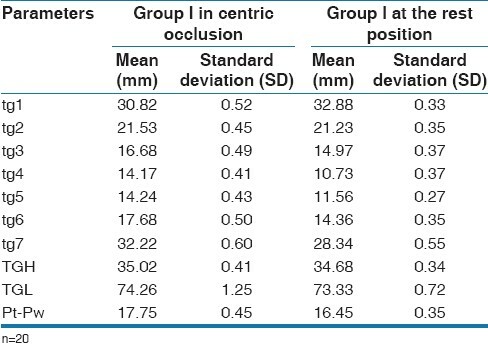 [Table 3] shows the comparison of changes from the rest position to centric occlusion in group I and group II. All the comparisons of changes were statistically non-significant, but trend showed that there was greater change in various parameters from the rest position to centric occlusion in group II than in group I. Partial length of tongue (tgl) measures the length of tongue in the posterior portion (root) of the tongue. When the mandible moved from the rest position to centric occlusion, the partial length of this region was found to be increased in both group I and group II, meaning by that the tongue root moved anteriorly from the rest position to centric occlusion in both the Groups. This finding of the present study is supported by Fishman  and Rakosi  in which they observed that posterior portion of tongue moved anteriorly from rest to closure. Partial length of the tongue (tg2) indicates the partial length of the tongue in the posterior region of dorsum. As the mandible moved from the rest position to centric occlusion, the posterior region of dorsum of tongue moved antero-inferiorly in the Angle Class I normal occlusion group, but in the Angle Class II division 1 malocclusion group (P>0.05), it was not moved significantly postero-superiorly. This showed a tendency towards retrusion of tongue and backward positioning of tongue in Angle Class II Division 1 malocclusion. Partial length of the tongue (tg3) in this part of dorsum of tongue is greater in the group I than in group II in both rest position and centric occlusion. The partial length of tongue is increased in both groups as tongue moved from the rest position to centric occlusion, group I had value (-1.71±0.38) and group II had value (-2.47±0.31). This indicates that tongue moved postero-superiorly in this region significantly in both Groups (P value in group I was <0.05 and in group II was P<0.01). This finding of the present study is supported by the study by Fishman  in which he found that dorsum of tongue in the rest position had lower position. That is because of inter co-ordination of muscles of tongue and the mandible. Partial length of the tongue (tg4) measurement showed that the partial length of tongue in this part is more in group II than in group I in both rest and centric occlusion. Finding was supported by the study of Rakosi  in which they found that dorsum was higher in Angle Class II Division 1 malocclusion as compared to the Angle Class I normal group. Study suggests that the movement of tongue in this part was superiorly from the rest position to centric occlusion. Partial length of the tongue (tg5) measurement showed that the partial length of the tongue in this region was more in group II than in group I subjects in both the centric occlusion and at the rest position. Partial length of the tongue (tg6) measurement showed the change in the tongue position in anterior region of the dorsum. The present study showed that the partial length of the tongue in this part of dorsum was more in group II as compared to group I in both rest position and centric occlusion. Partial length of the tongue (tg7) measurement showed that with the movement of the mandible from the rest position to centric occlusion the tip of the tongue moved anteriorly in both the groups although the movement was found to be greater in group I (-2.92±0.49) than in group II (-1.69) subjects. Similar findings were also observed by Rakosi  that the tip of the tongue was already more retracted in the Class II Division 1 malocclusion, so that anterior movement from the rest position to centric occlusion is less. The study by Subtelny et al also demonstrated that in Class II Division I malocclusion, the tongue tip was more retruded with respect to the maxillary incisors than in the subjects with Angle Class I normal occlusion. The present study showed that as the mandible moved from rest to occlusion, there was an increase in the height of the tongue (TGH) significantly in group II (P<0.05) and non-significantly in group I (P>0.05). The study by Guayl  found that in the Angle Class II Division I malocclusion group, the tongue showed some lower position as compared to Angle Class I normal occlusion because of the adaptation to the surrounding environment. Brodie  supported this finding and explained that the position of the tongue in relation to dental arches is determined by its own growth and by three parts of its suspension. Rakosi  showed that the changes shown by the dorsum of the tongue are less as compared to the root of the tongue and the tip of the tongue as in the present study. Milne and Cleall  observed that tongue, hyoid, and mandible work as an integrated unit so the tongue height changed with the mandibular posture. For the evaluation of tongue length (TGL), the result of the present study showed that as the mandible was closed from the rest position to the centric occlusion, there was an increase in the TGL, that is statistically insignificant in group I (P>0.05) and significant (P<0.05) in group II subjects. In the cephalometric analysis of the rest position of tongue Lowe et al. observed that short tongue length correlated with a linear combination of upright central incisors, a smaller overjet, and a low ANB angle. This view supported the findings of the present study. In the present study, it was observed that as there was closure of mandible from the rest position to centric occlusion there was a significant increase in the distance of tongue from pharyngeal wall (Pt-Pw) in group I (P<0.001) and an insignificant increase in this space in group II (P>0.05), thereby meaning that tongue was posteriorly placed in the Angle Class II Division 1 malocclusion group. View of Baker  supported this finding of the present study that backward positioning of tongue leads to cervical underdevelopment and retrusion of mandible. Previous radiographic and cine radiographic studies suggested that tongue position and mandibular position are functionally integrated. The functional implications of the sizes and position of tongue with changing posture of mandible would be better studied by reference to cine radiographic material, than by purely static studies based on lateral head cephalogram. Further studies are desirable into the correlation between tongue size (microglassia, macroglassia), tongue posture, and attachment of lingual frenum in determining the tongue position and its effect on the dentoalveolar form. From the present study, following conclusion can be drawn: with the closure of mandible from the rest position to centric occlusion the tongue moved antero-superiorly in the tip region, superiorly in the dorsum region and antero-superiorly in the posterior region in Angle' Class I normal occlusion and postero-superiorly in Angle's Class II Division 1 malocclusion. In Angles Class II Division 1 malocclusion tongue position was characterized by a greater change in tongue position and greater increase in length and height of tongue and a lesser increase in distance between pharyngeal wall and tongue as the mandible moved from the rest position to centric occlusion. 1. Peat JH. A cephalometric study of tongue position. Am J Orthod 1968;54:339-51. 2. Rakosi T. An atlas and manual of cephalometric radiography. London, Wolf Medical Publication Limited, 1978. p. 96-8. 3. Kapoor DN, Sharma VP, Grover CM. Dentofacial pattern of tongue thrusters - a cephalometric study. J lnd Dent Assoc 1979;51:295-7. 4. Brodie AG. "Facial Pattern". A theme on variation. Angle Orthod 1946;16:75-86. 5. Fishman LS. Postural and dimensional changes in the tongue from rest position to occlusion. Angle Orthod 1969;39:109-13. 6. Nanda RS, Dandajena TC, Nanda R. Biomechanics strategies for nonextraction Class II malocclusions. In: Nanda R, (editor). Biomechanics and esthetic strategies in clinical orthodontics, 1 st ed, St. Louis: Missouiri, Elsevier; 2009. p.177. 7. Graber TM. Functional analysis. In. Dentofacial orthopedics with functional appliances. In: Graber TM, Rakosi T, Petrovic AG (editors). 2 nd ed, Maryland Heights, Missouri: Mosby; 1997 . p. 127-8. 8. Gollub MJ, Bains MS. Barium sulfate: a new (old) contrast agent for diagnosis of postopera-tive esophageal leaks. Radiology 1997;202:360-2. 9. Milne JM, Cleall JF. Cinematographic study of functional adaptation of oropharyngeal structures. Angle Orthod 1970;40:267-83. 10. Guay AH, Maxwell DL, Beecher R. A radiographic study of tongue posture at rest and during the phonation of I s I in Class III malocclusion. Angle Orthod 1978;48:10-22. 11. Bell WA. Muscles pattern of late fetal tongue tip. Angle Orthod 1970;40:262-5. 12. Subtelny JD, Subtelny JD. Malocclusion, speech and deglutition. Am J Orthod 1961;47:685-97. 14. Baker RE. Tongue and dental function. Am J Orthod 1954;40:927-39.